After reading this story, you may begin to see zombies in a whole new light. While they get a lot of criticism for their love of human flesh, it turns out that some zombies also go out of their way to support the troops. The Westboro Baptist Church had recently announced that it would be holding one of its protests outside the Joint Base Lewis-McChord in DuPont, Washington. But last Friday, the controversial group was met with a far larger group of counterprotesters—dressed as zombies. 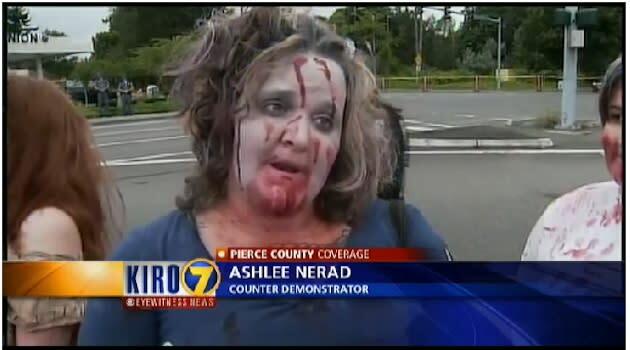 "I have decided that the most violent free way to protest back is simple... a zombie apocalypse. So I ask EVERYONE who is able to attend that day, please come dressed in your finest zombie outfit," Neace wrote on the page. "We wanted to turn something negative around, into something people could laugh at and poke fun at," Neace told the paper. "It was the easiest way to divert attention from something so hateful." "I think that their message is very hateful, and Jesus was not a hateful person. He loved everybody," counter-protestor Ashley Winslow told KIRO-TV. Here's the video of the protest and counter protest from KIRO.